SALE PENDING!! 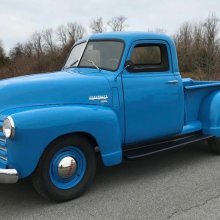 Off to Nebraska! 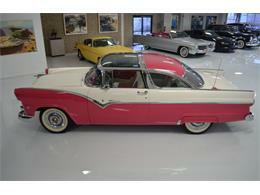 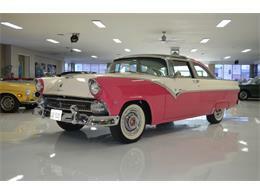 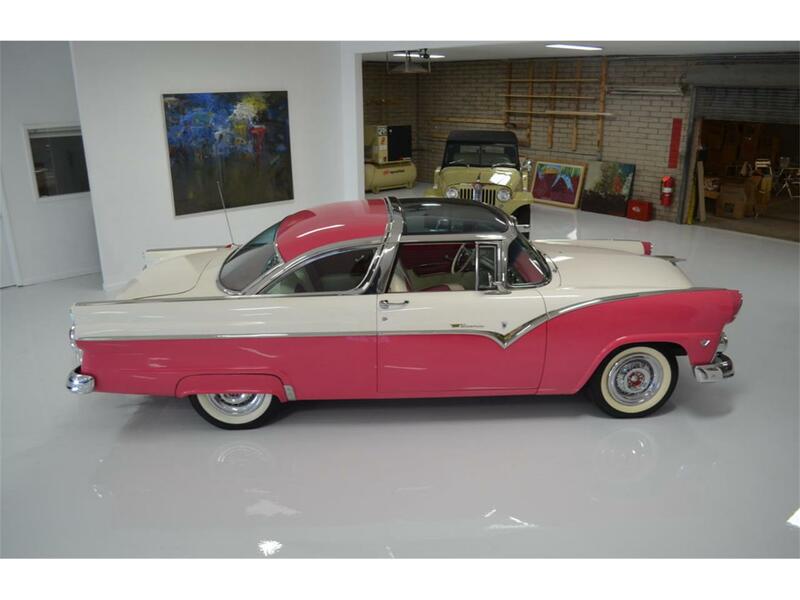 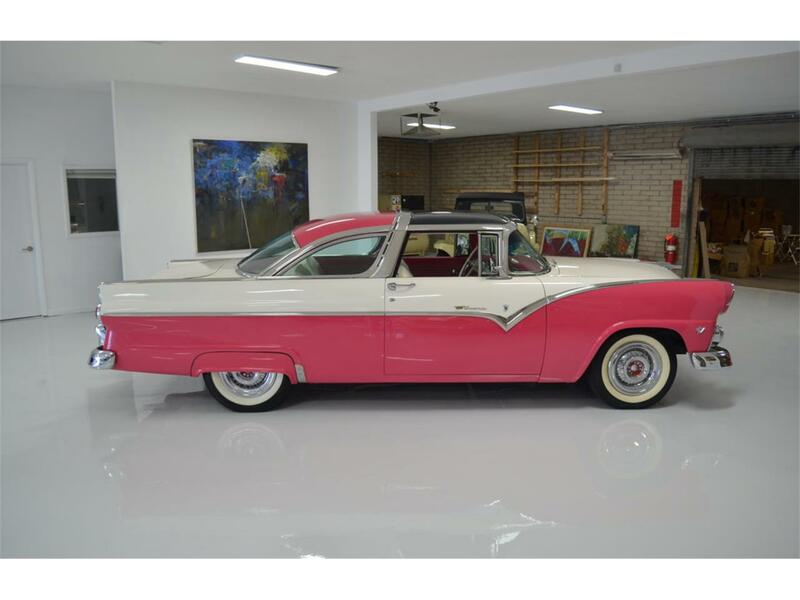 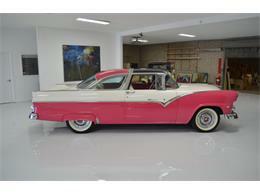 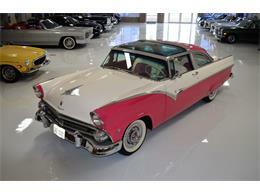 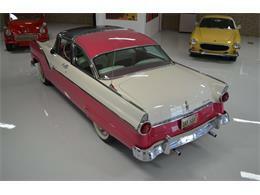 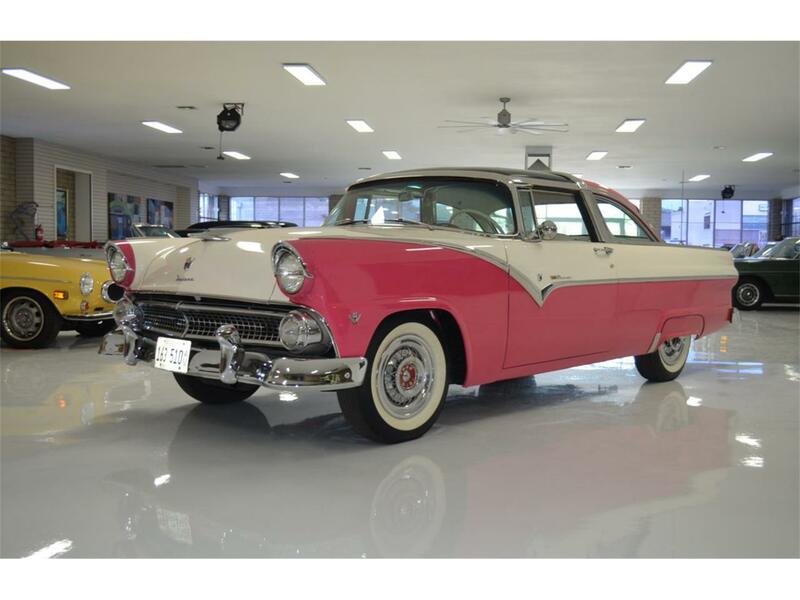 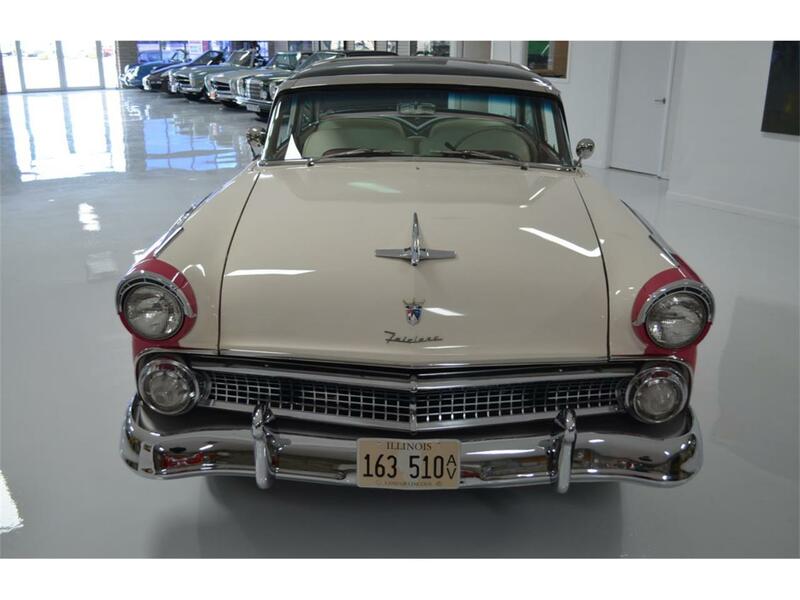 This is an incredibly rare 1955 Ford Fairlane Crown Victoria Skyliner. 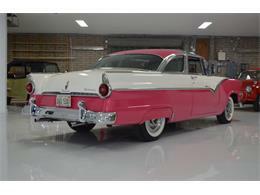 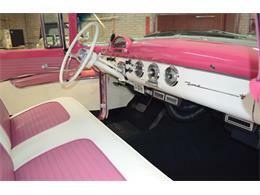 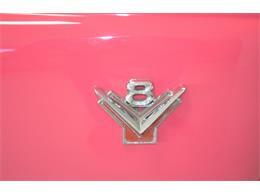 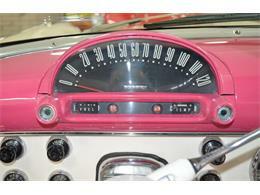 With under 2,000 made and in iconic 1950's colors, this is a terrific car to take to cruise nights or car shows. 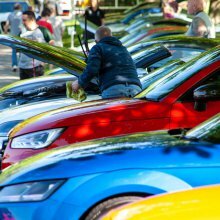 It is guaranteed to attract crowds! 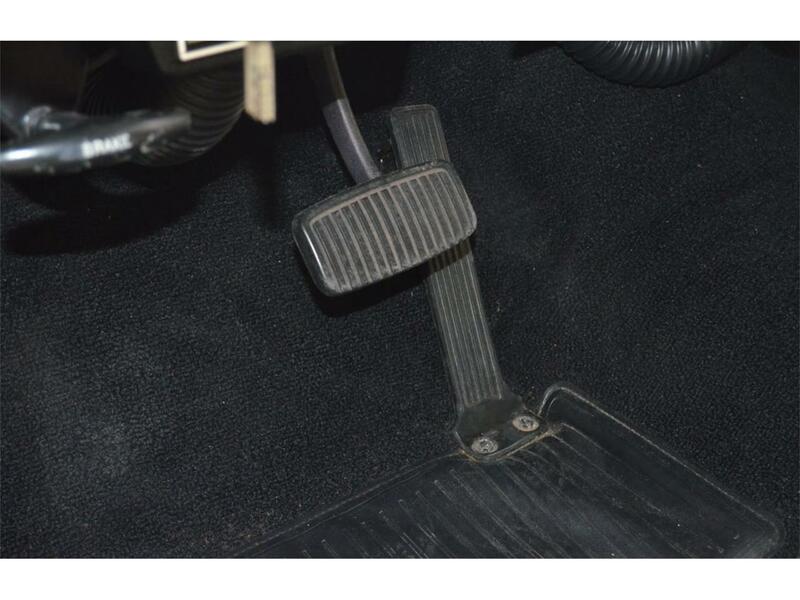 And what a kick to drive! 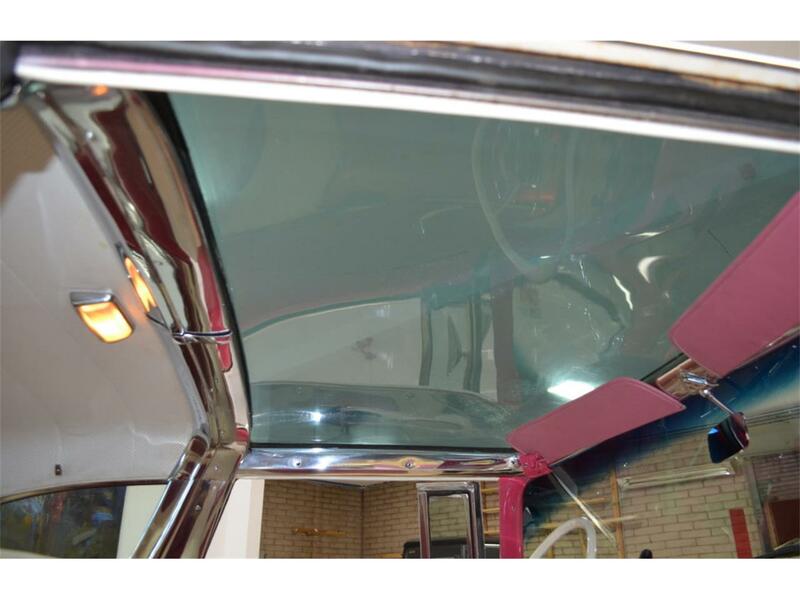 With the smoked glass roof the interior magically lights up! We are selling this motorcar for a client and friend who has an exclusive 65 car collection. He bought this car on November 24, 2010 and immediately drove it from Buffalo, NY to St.Louis. 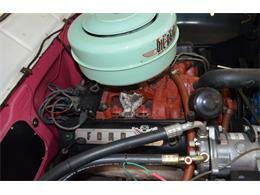 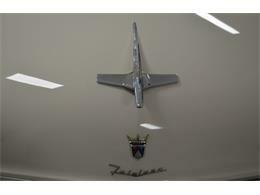 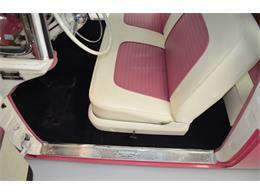 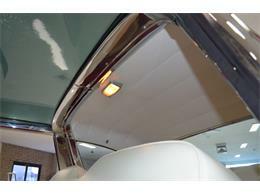 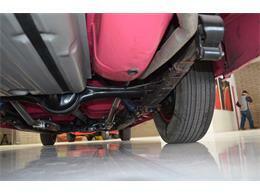 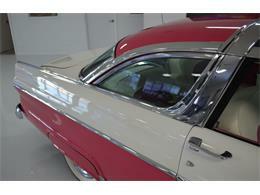 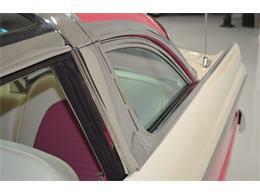 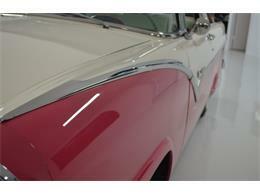 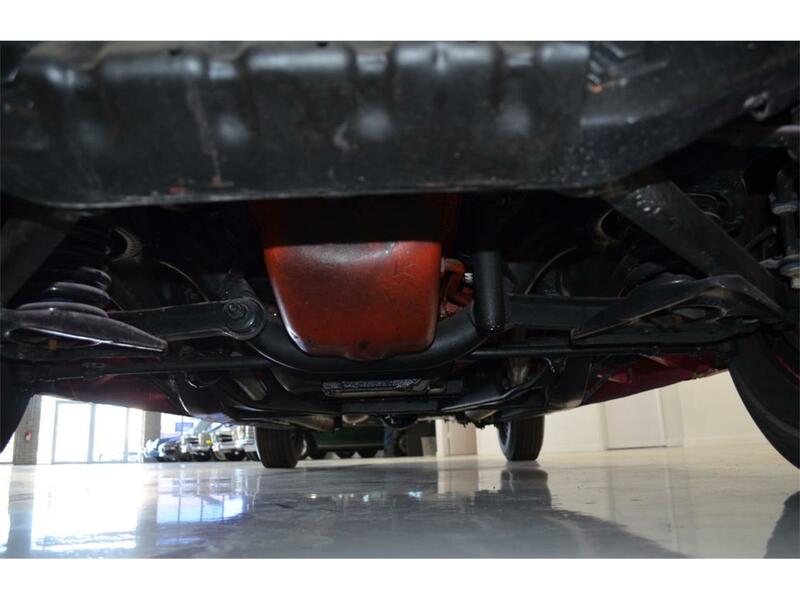 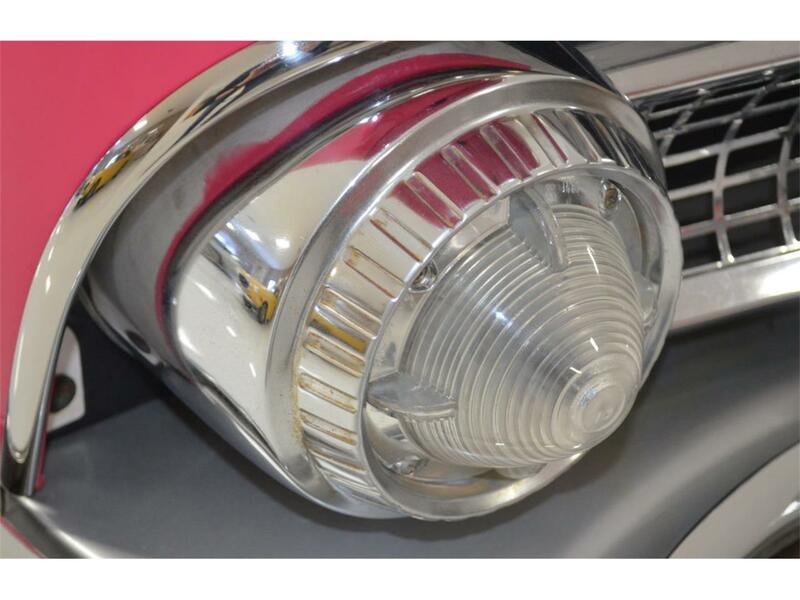 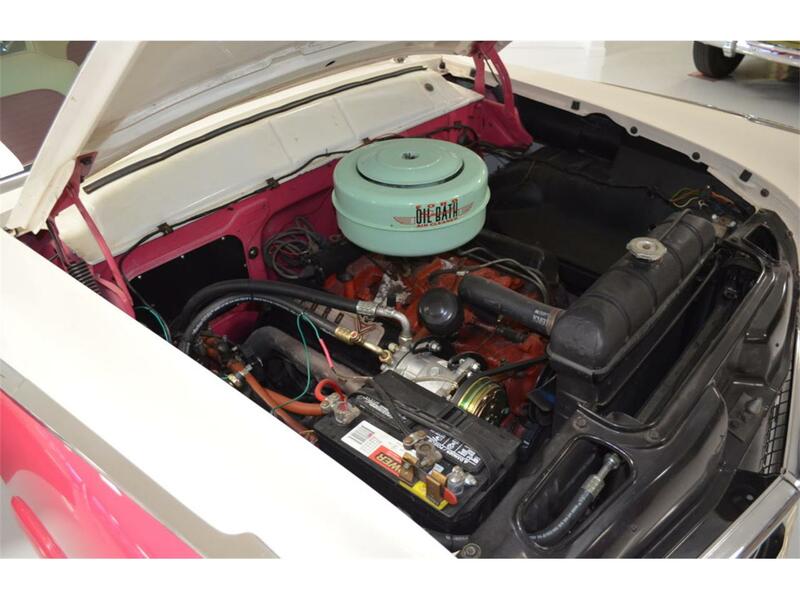 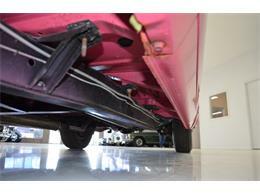 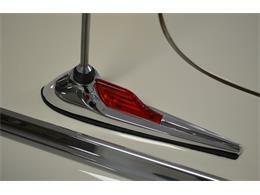 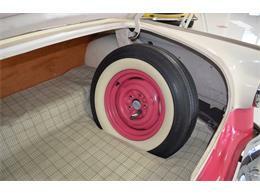 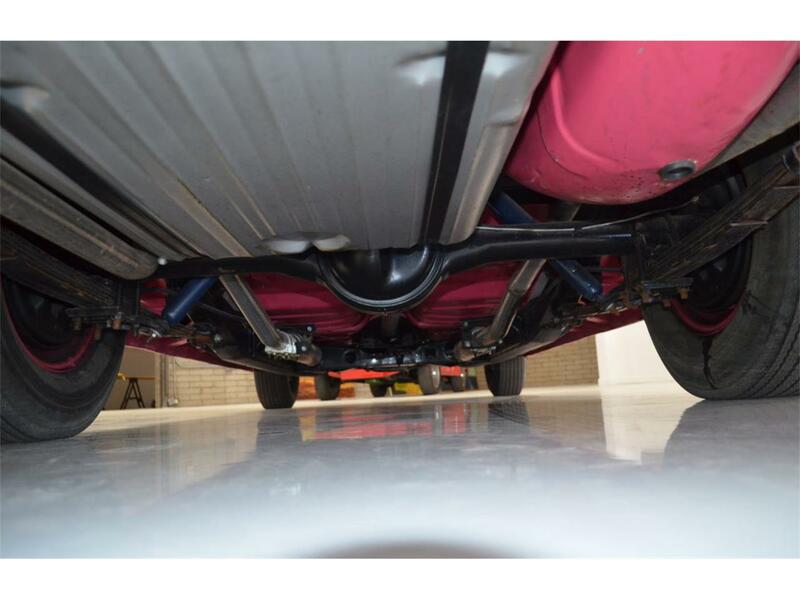 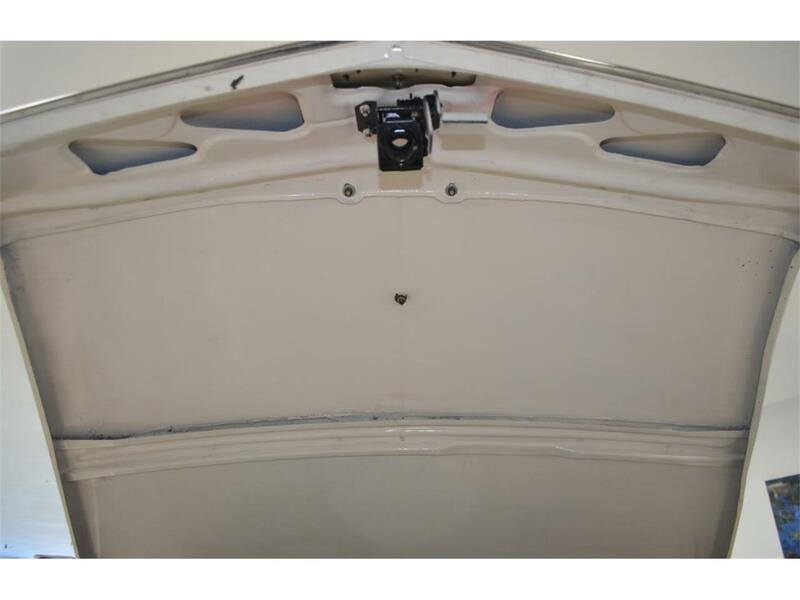 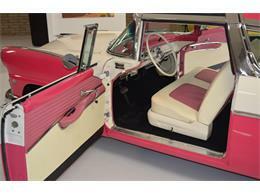 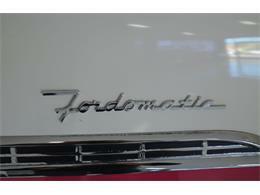 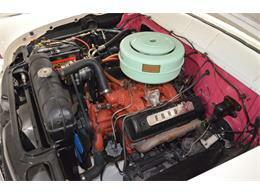 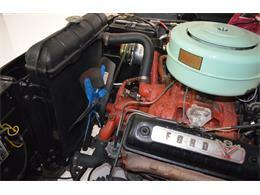 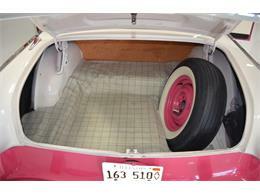 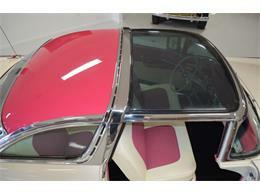 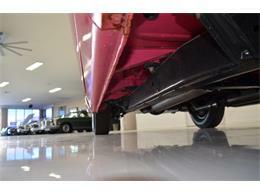 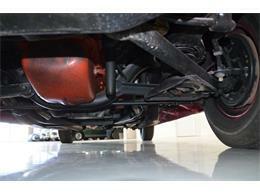 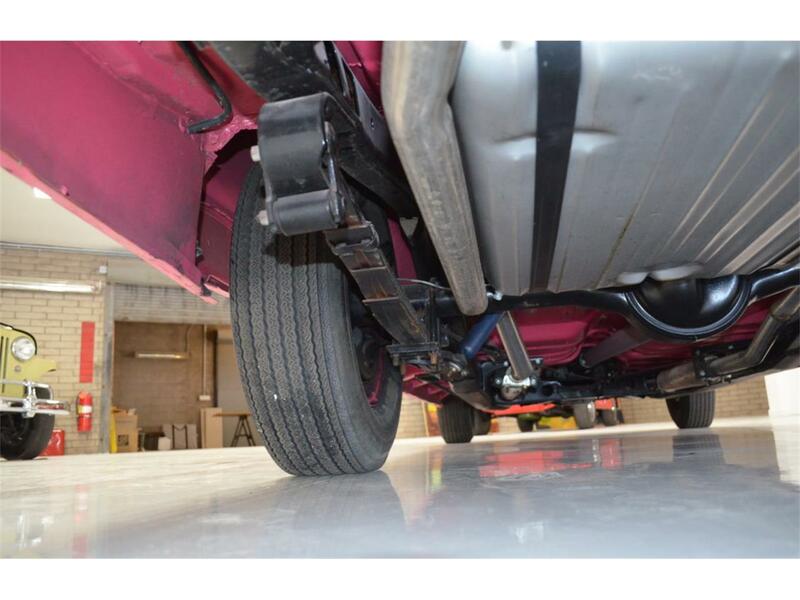 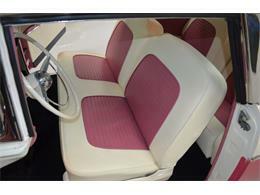 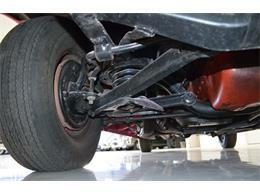 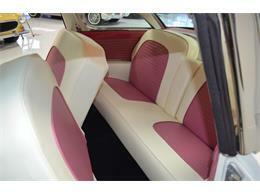 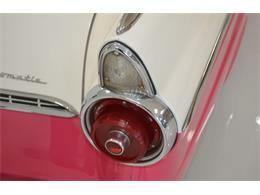 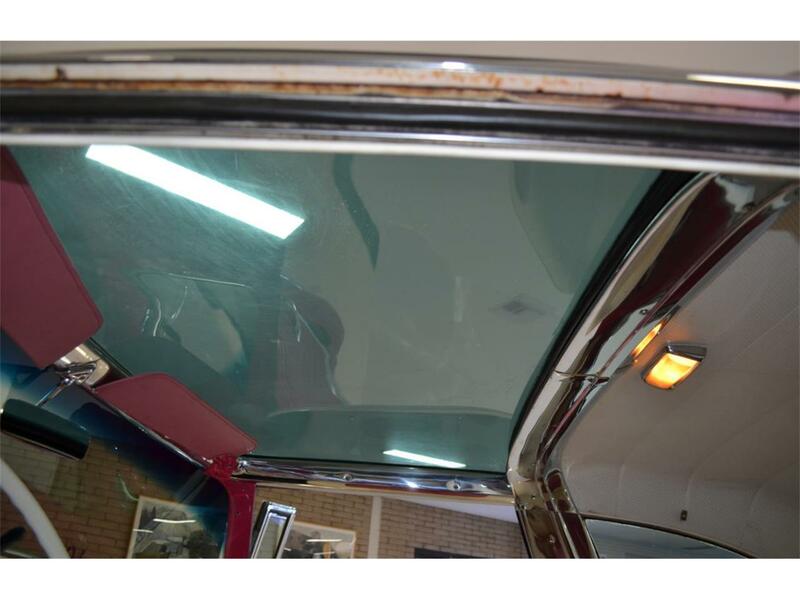 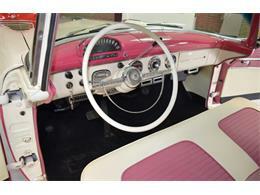 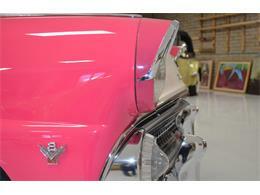 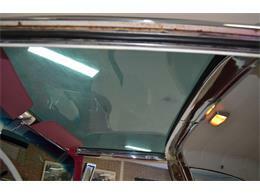 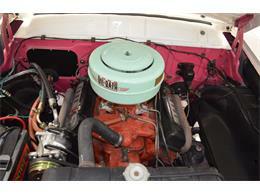 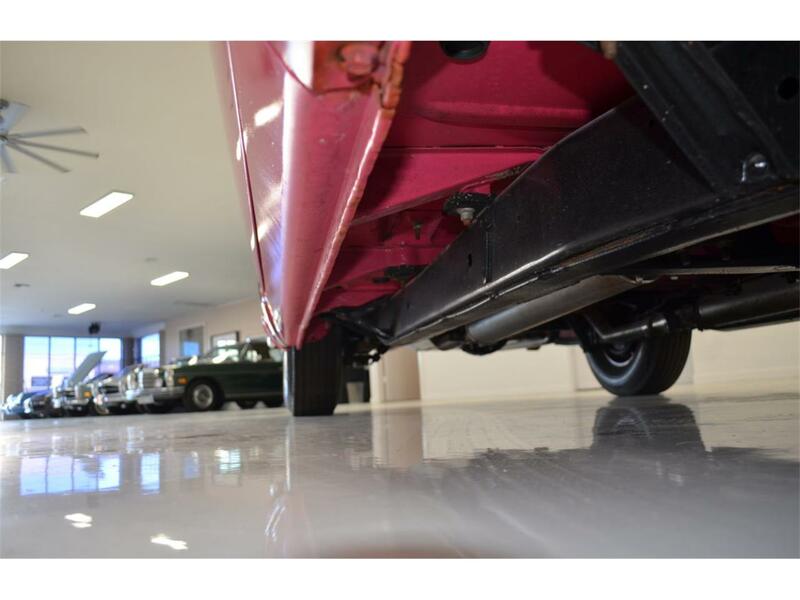 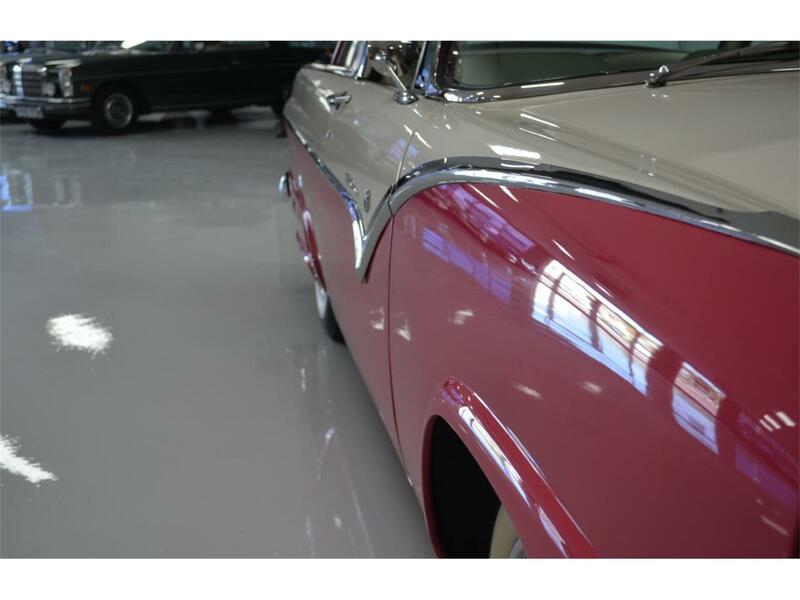 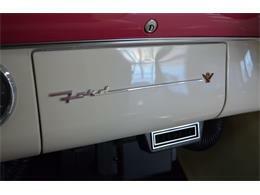 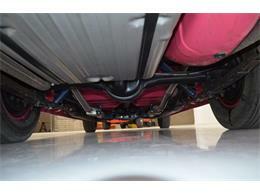 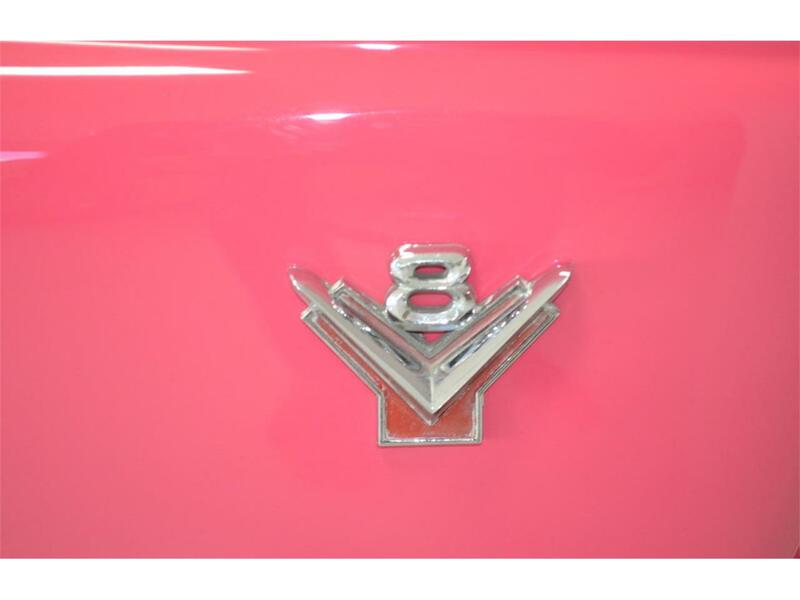 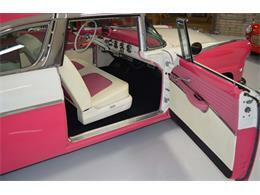 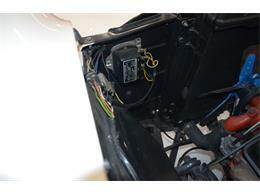 This car drives very well as it benefited from a comprehensive restoration before his ownership. 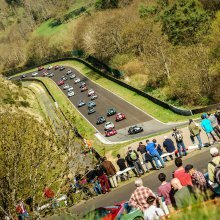 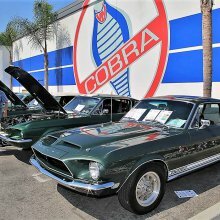 It remains in excellent condition today for car shows and tours alike! 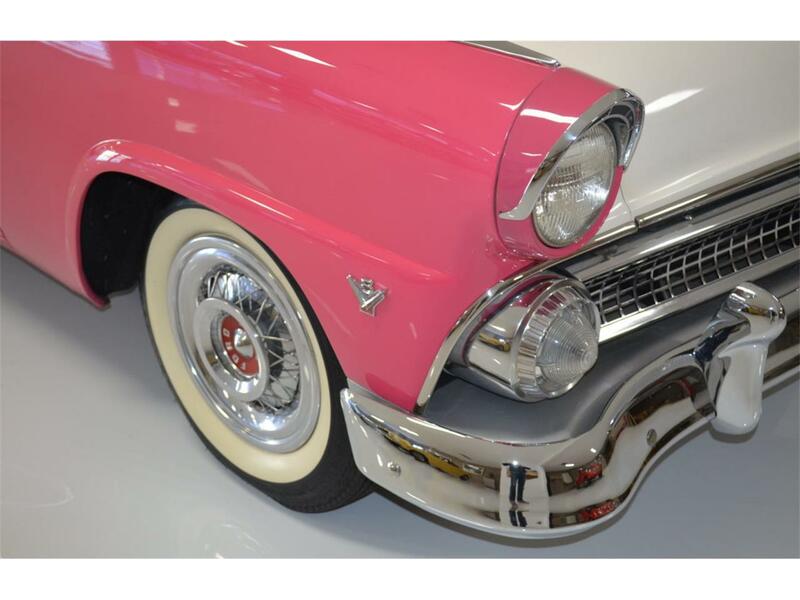 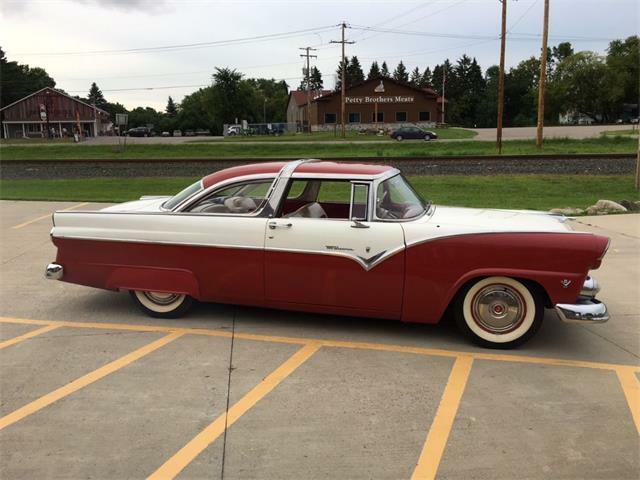 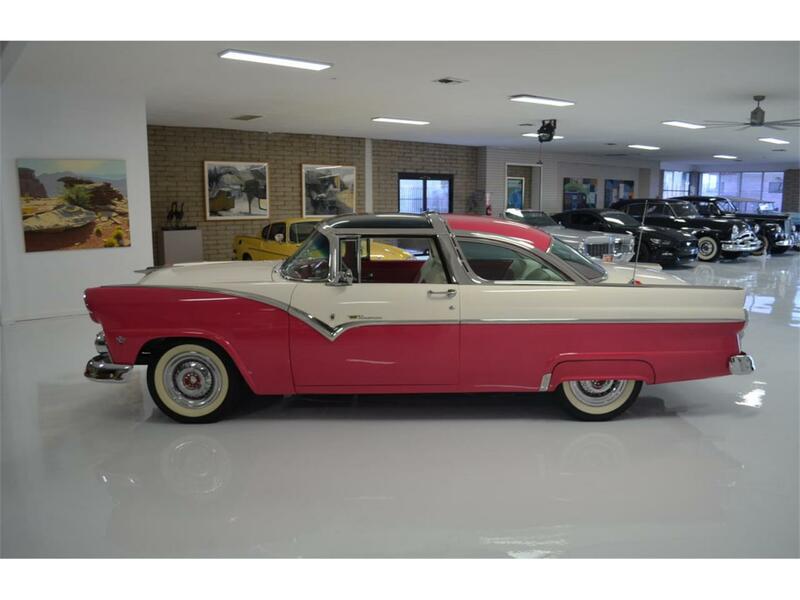 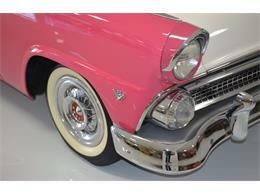 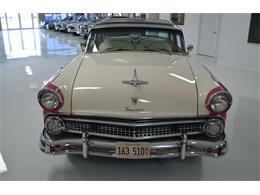 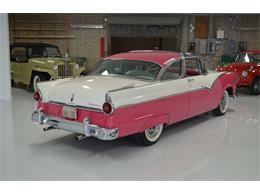 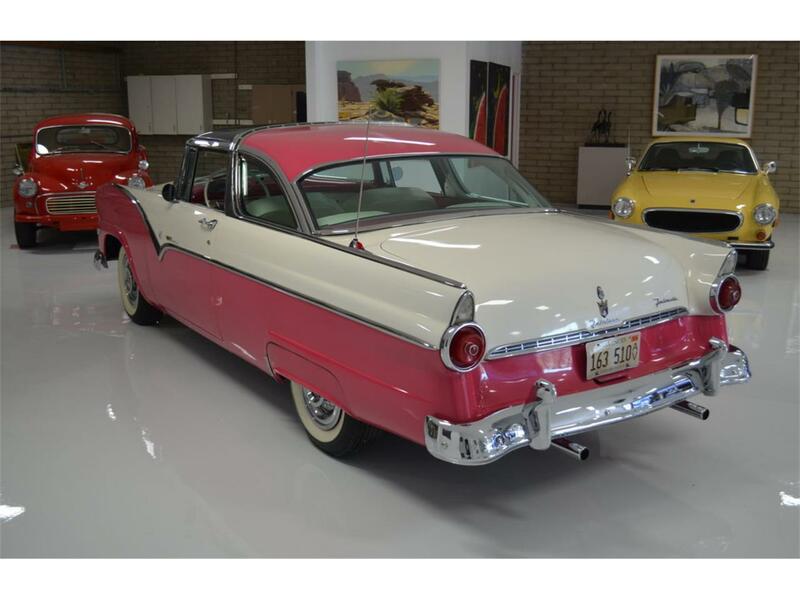 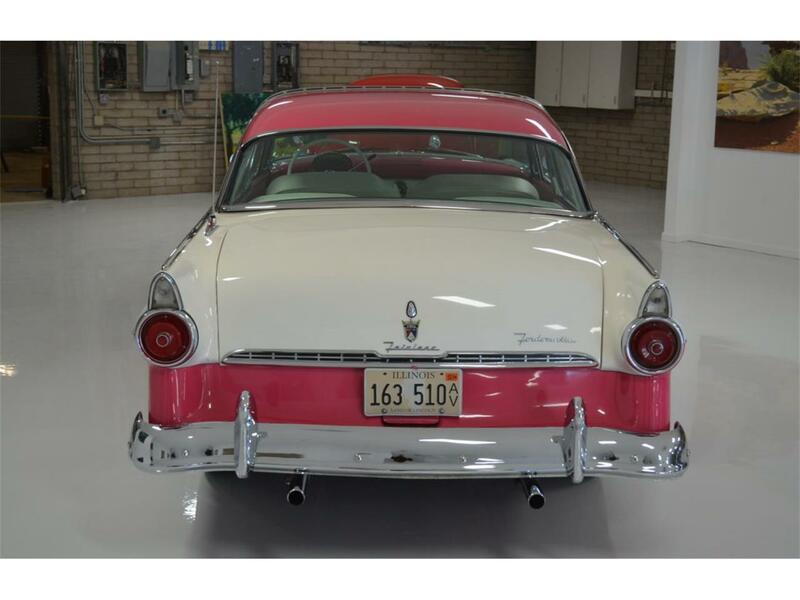 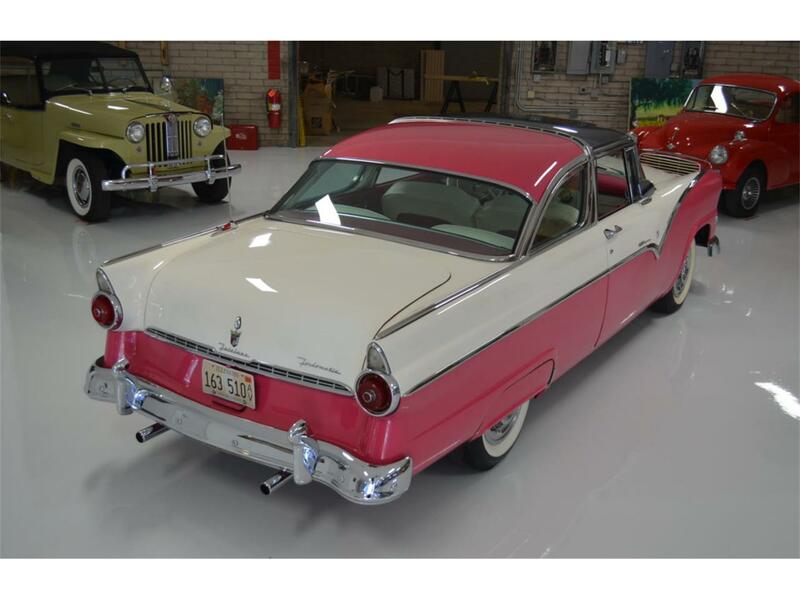 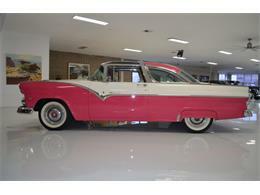 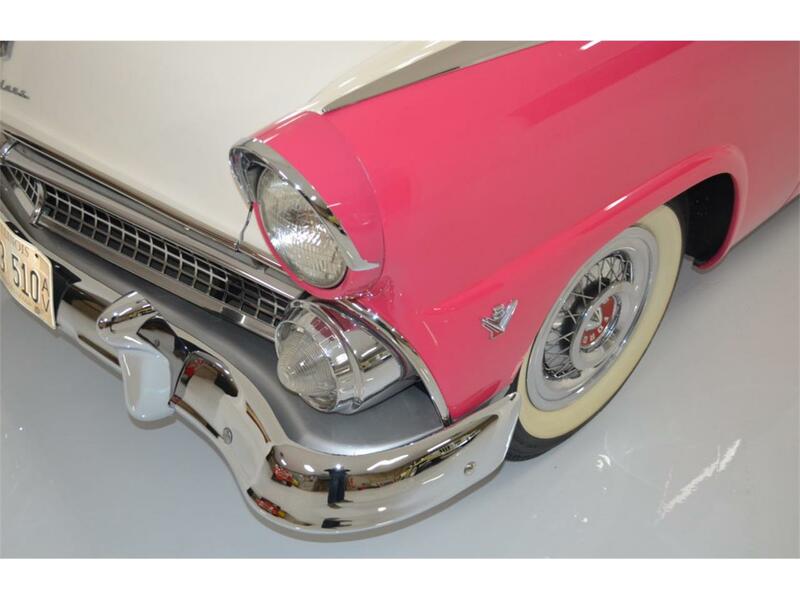 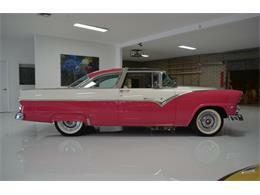 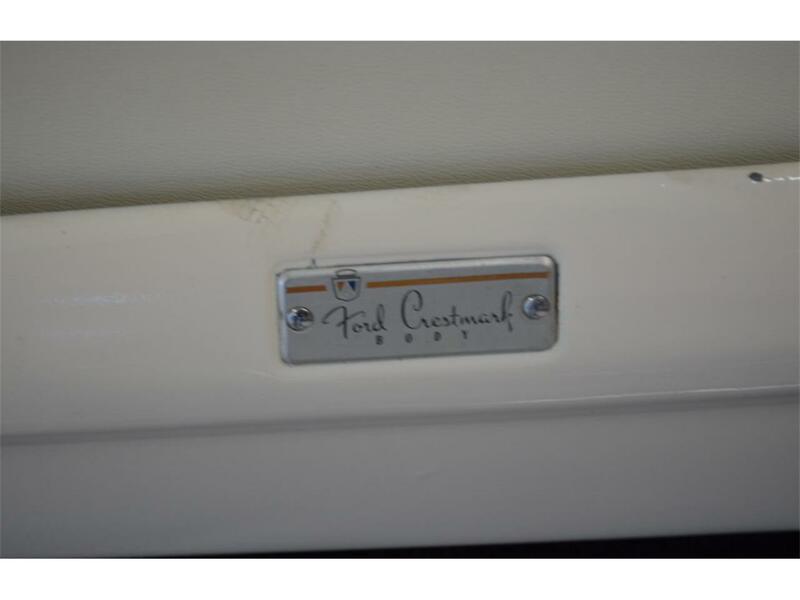 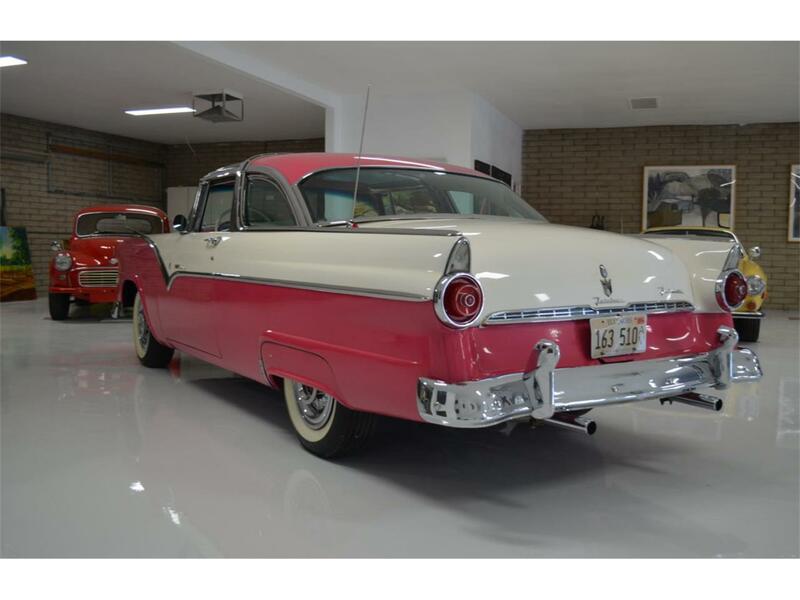 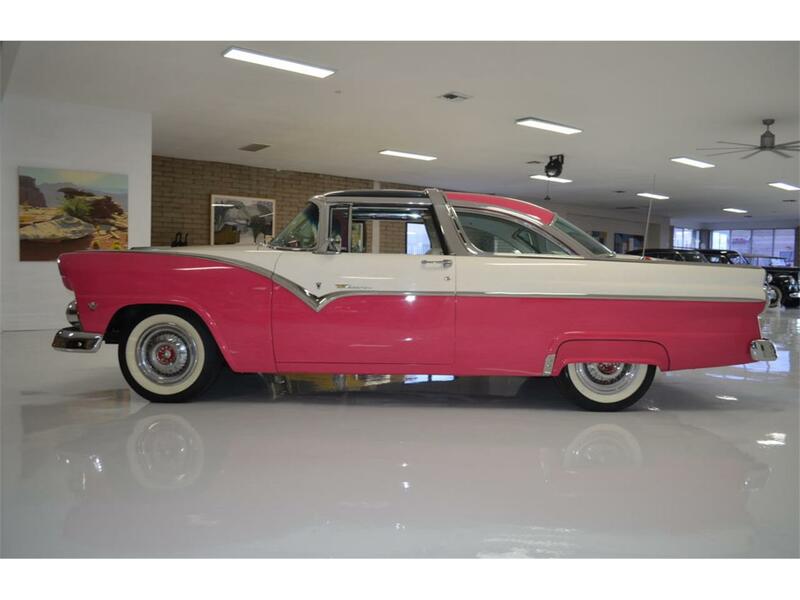 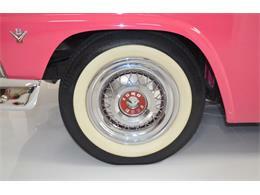 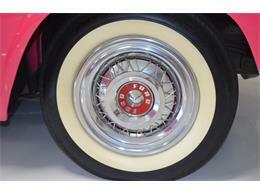 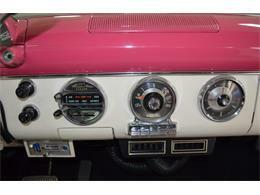 Classic Promenade Presents: The 1955 Ford Fairlane Crown Victoria Skyliner Chassis No. 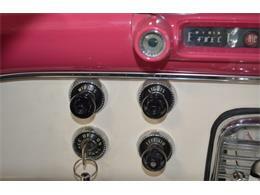 -U5FF153458 Car Highlights - low mileage of 53,400 miles - Vintage Air Conditioning setup -negates the greenhouse effect!! - a piece of automotive design history - possesses a deeply desired chrome roof band, or "basket handle" - authentic thorough and correct older restoration Technical Specifications - V8 272-2v OHV (second year of Ford's "Y-block" overhead-valve V8) - Three-speed Ford-O-Matic transmission - Suspension: Coil-spring independent front suspension with a 3 piece ride stabilizer Live rear axle with semi-elliptic leaf spring suspension - Front and rear brakes are 11 inch hydraulic drums -Wheelbase: 115.5 inches The 1955 Ford Fairlane Crown Victoria Skyliner was a design icon of America in the 1950's. 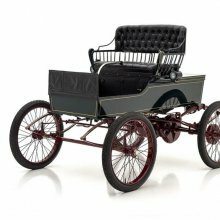 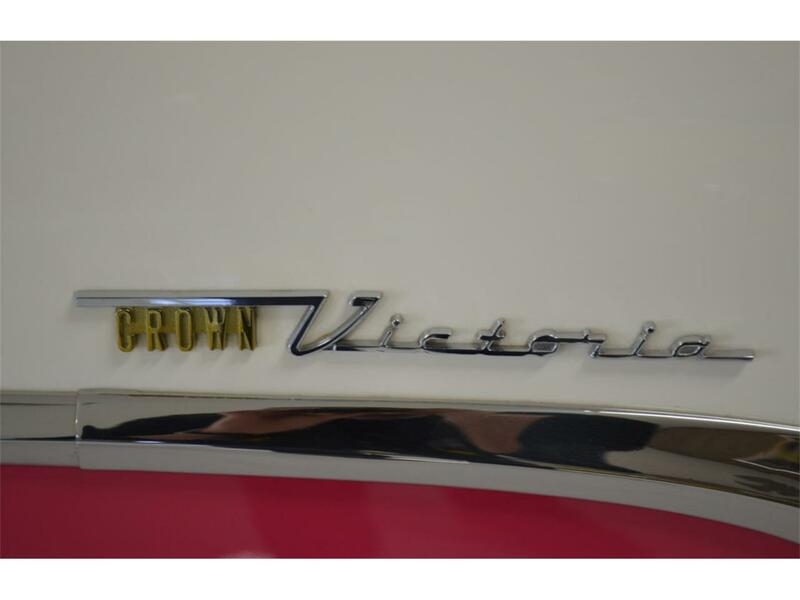 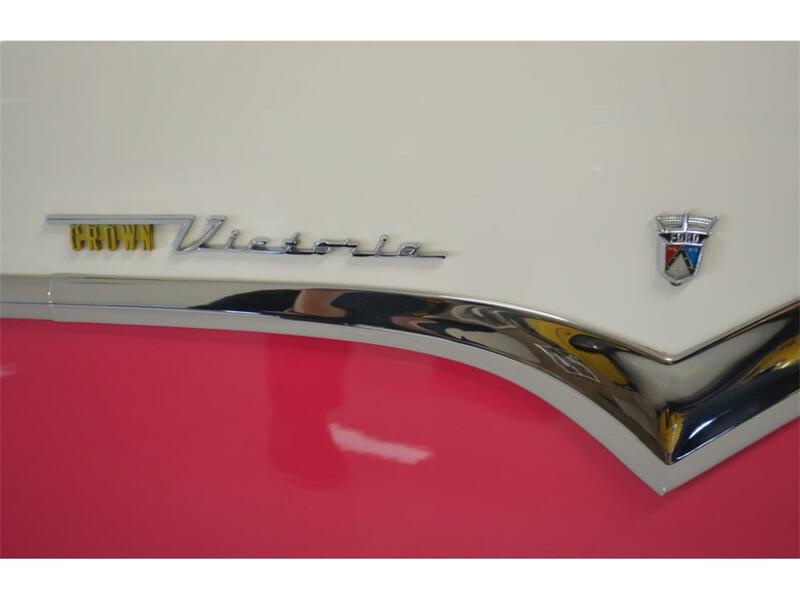 The body style of the Crown Victoria was actually a modern interpretation of a horse-drawn carriage, called a "Victoria". 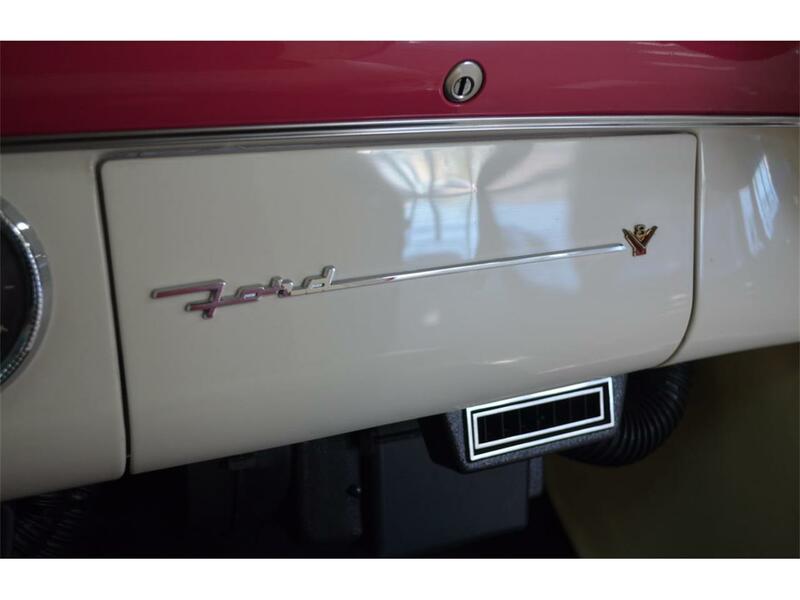 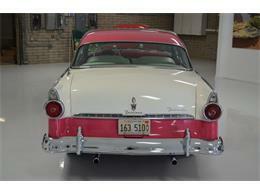 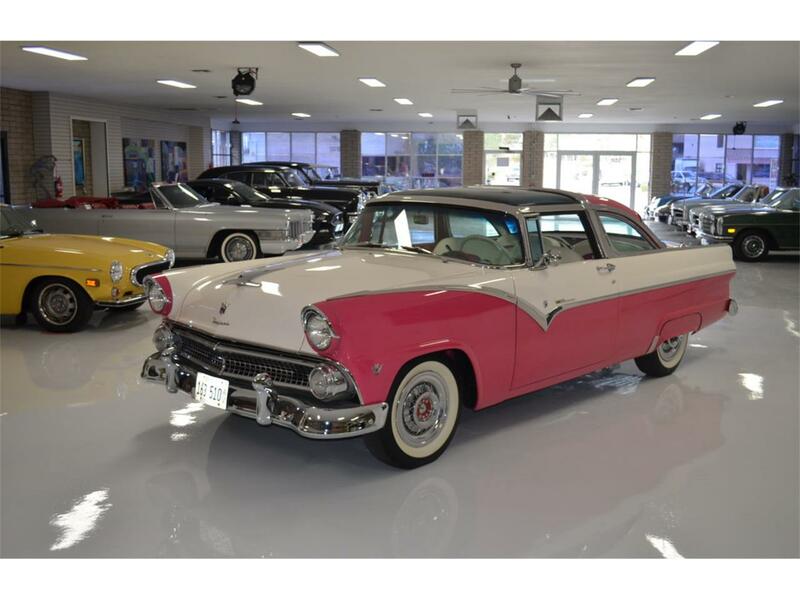 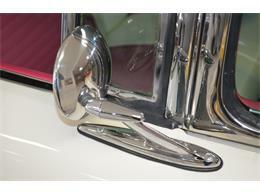 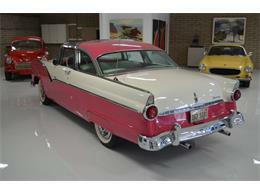 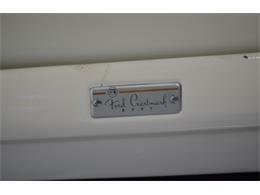 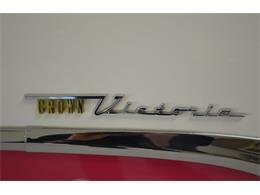 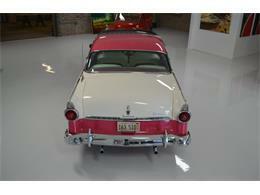 It is part of the top-of-the-line Fairlane Crown Victoria series, which replaced Ford's popular 1954 Crestline. 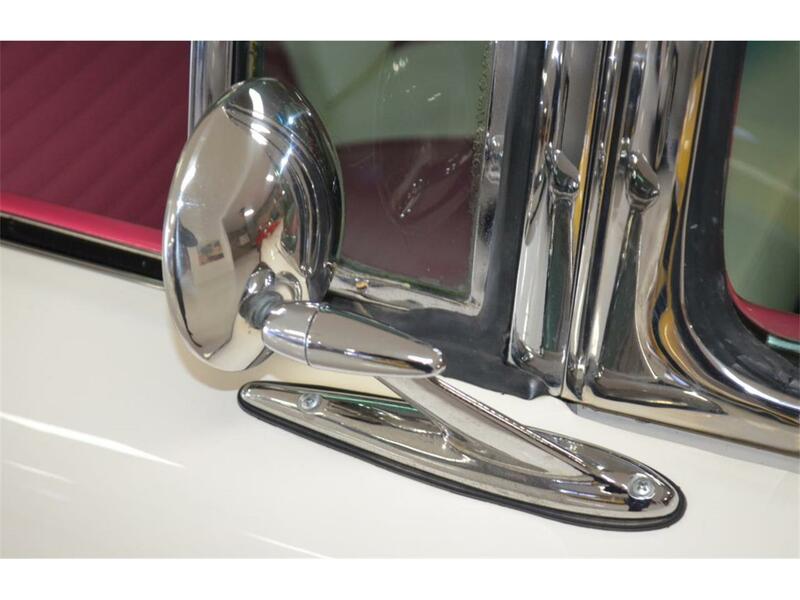 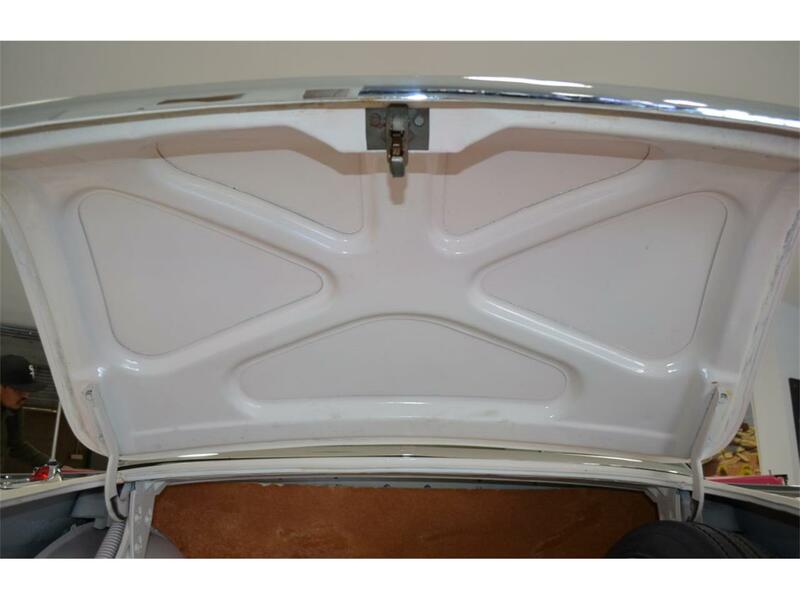 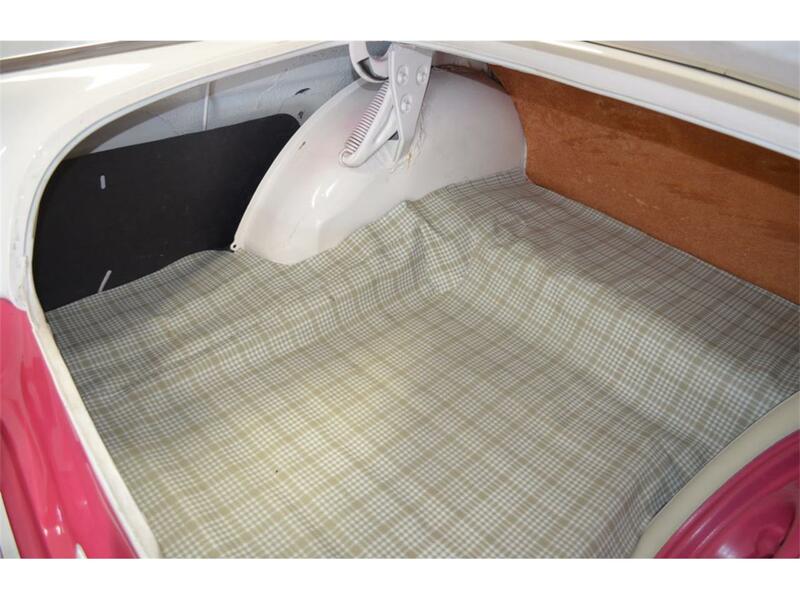 The '55 Crown Victoria Skyliner, affectionately known as the "Glasstop Vicky", shared a non-structural chrome roof band, or "basket handle," with its predecessor, but added a smoked acrylic glass window over the front seat area. Ford built 1,999 Crown Victoria Skyliners with transparent roofs, indicative of the Skyliner trim level for 1955, at a base cost of $2,177.00 USD per car. 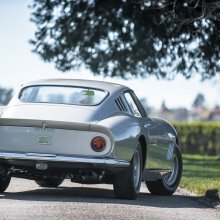 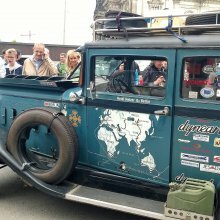 Of these cars, 402 were equipped with the optional factory SelectAire air conditioning package to offset heat build-up in the car's cabin. 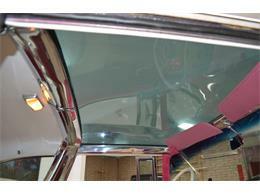 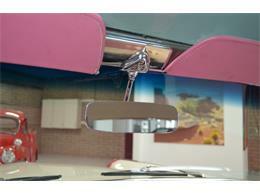 An optional snap-in sunshade or air conditioning system were also later offered and much desired. 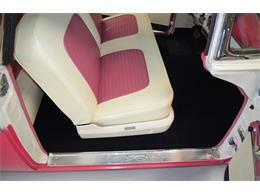 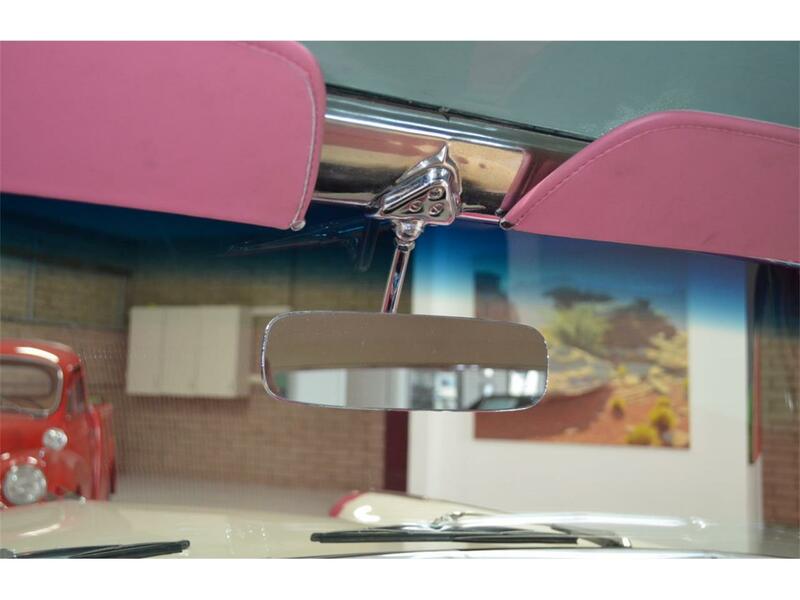 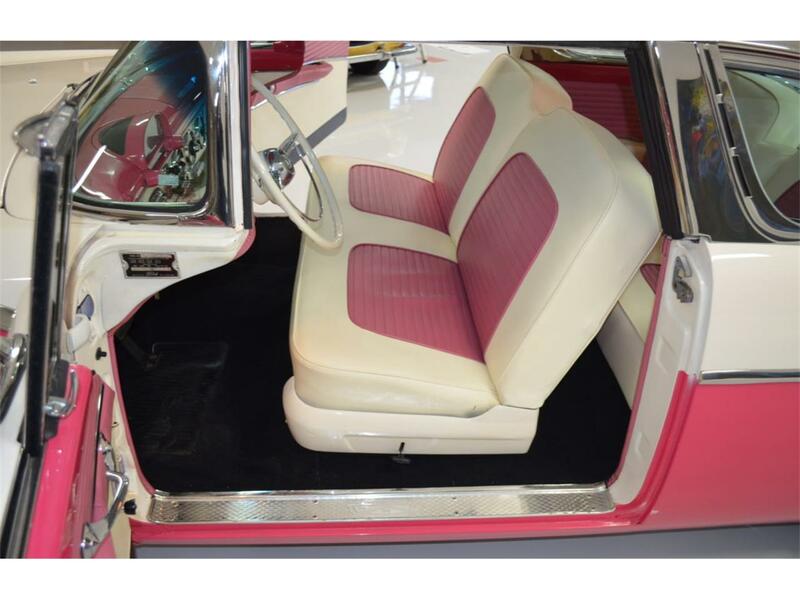 The exterior finish of this "Glasstop Vicky" is presented in a factory two tone and very fifties-esque 'snow-shoe white' with 'tropical rose'. 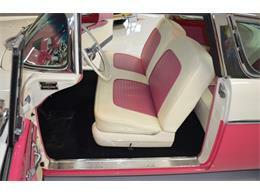 This color scheme continues throughout the interior. 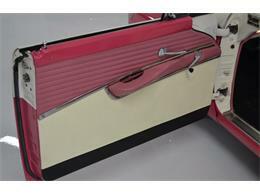 The seats are contoured and upholstered in glamorous metallic-threaded nylon with pleated bolsters in harmonizing color. 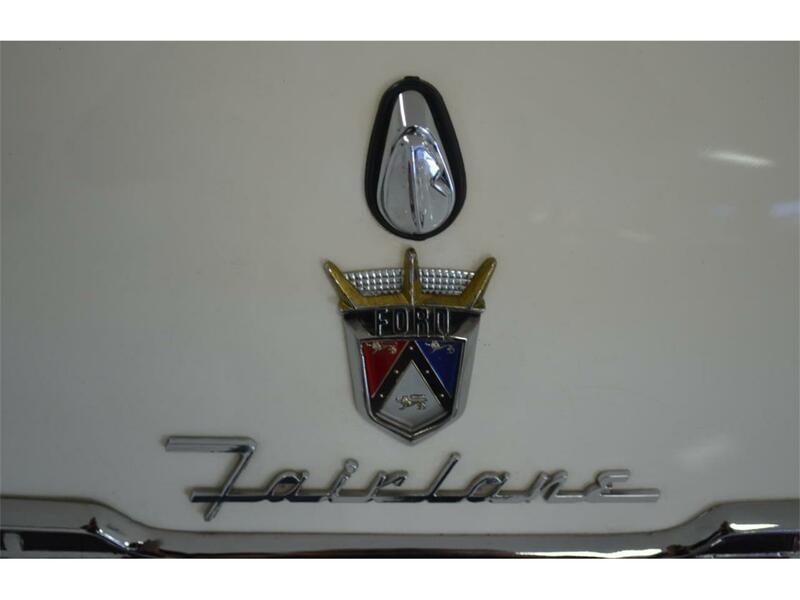 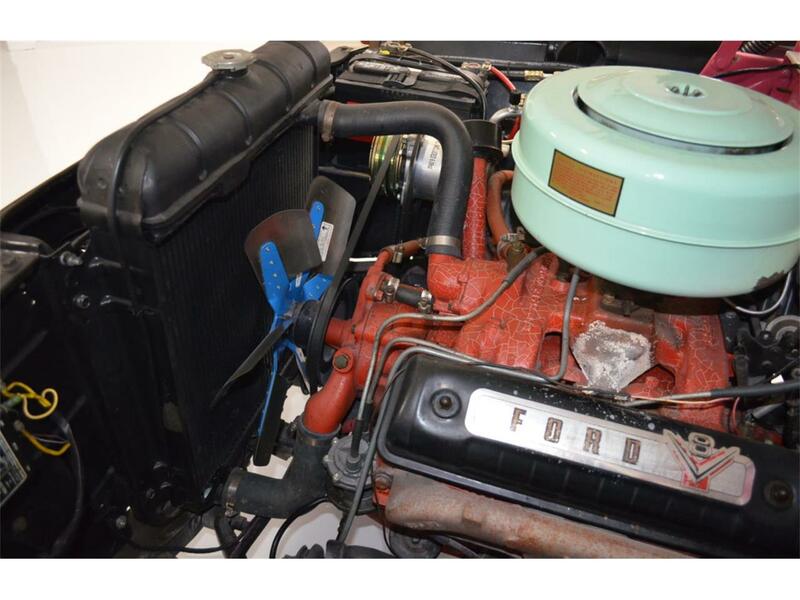 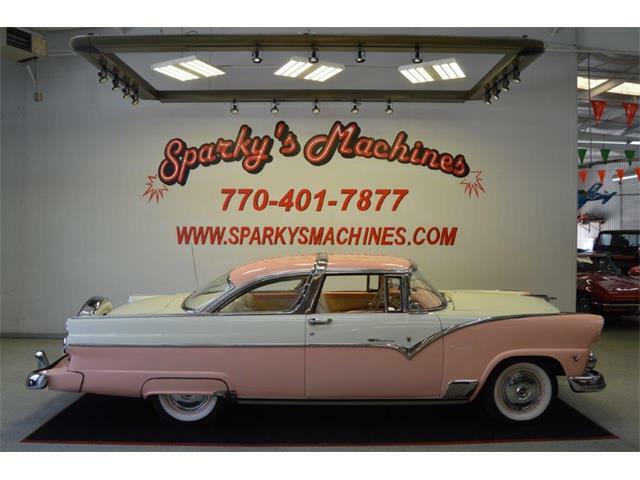 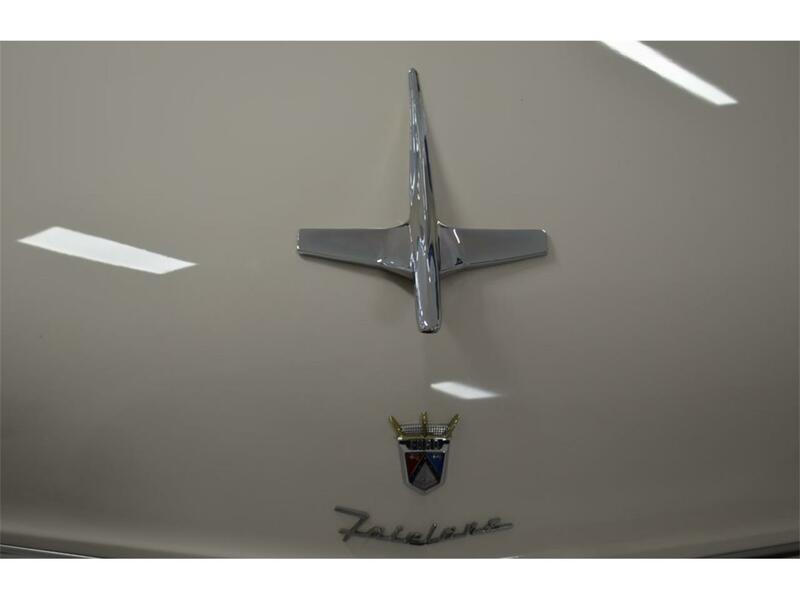 During manufacture in 1955, the displacement of the Fairlane engine was intentionally raised to 272 cubic inches, just so it could be a few cubes larger than Chevy's new 265 V8 of the time. It boasted high-efficiency "Turbo-Wedge Combustion Chambers" along with new 18-millimeter spark plugs. 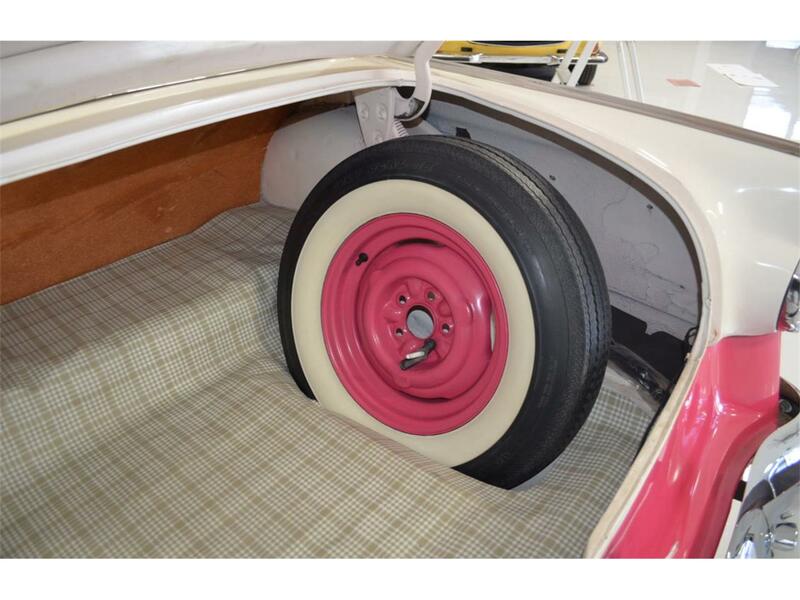 These larger plugs resisted deposit build up and sealed better due to tapered seat construction. 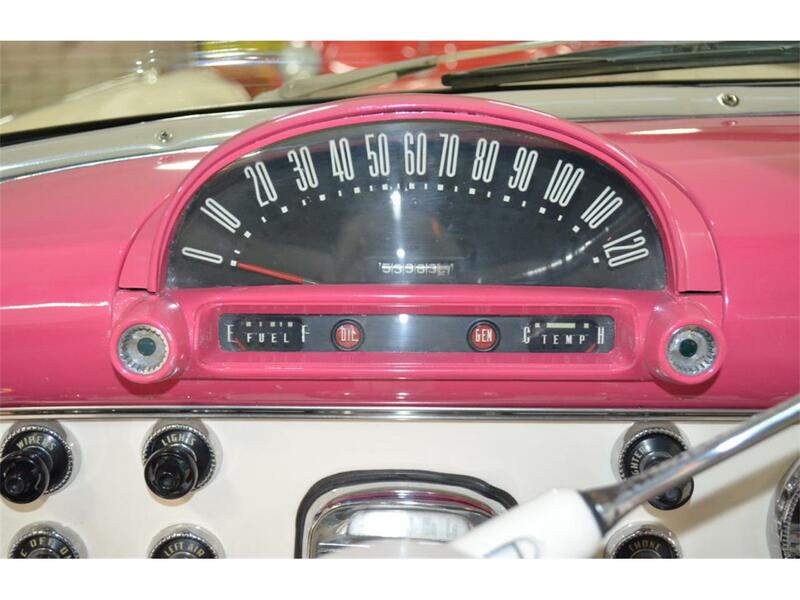 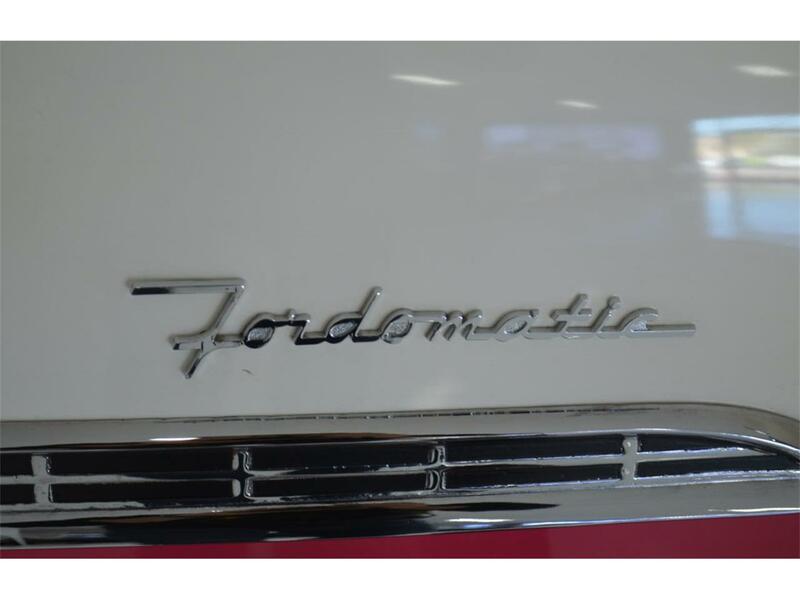 For 1955, Ford called its 3-speed automatic "Speed-Trigger Fordomatic Drive" since it incorporated a new automatic low gear to facilitate extra-fast starts or quicker, safer passing at low speeds. 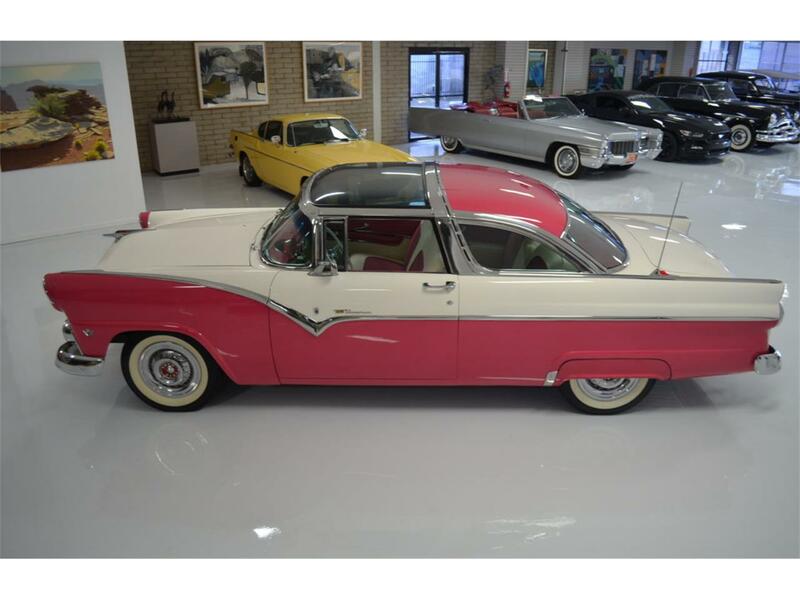 Sales of this particular model slumped in 1956 and as a result the car was only produced for two years; enhancing its present rarity. 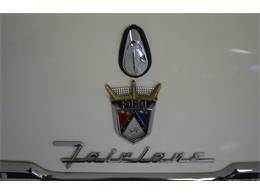 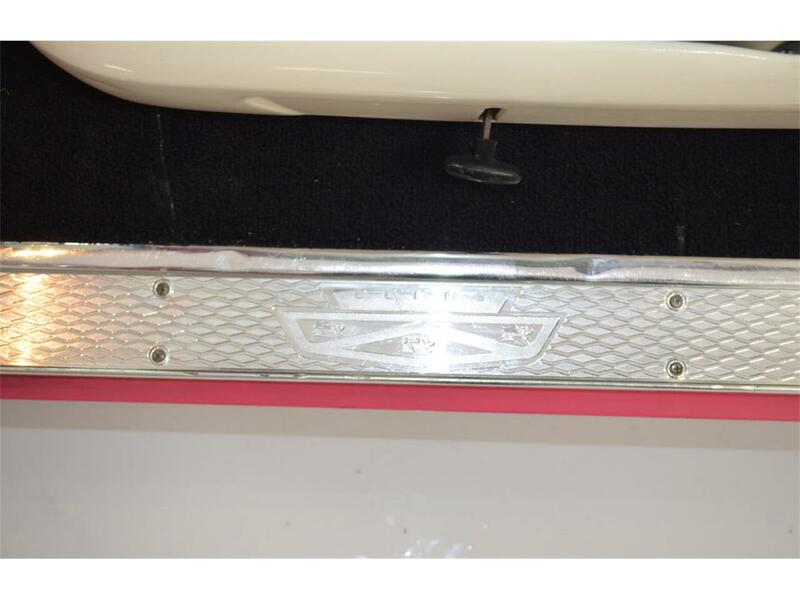 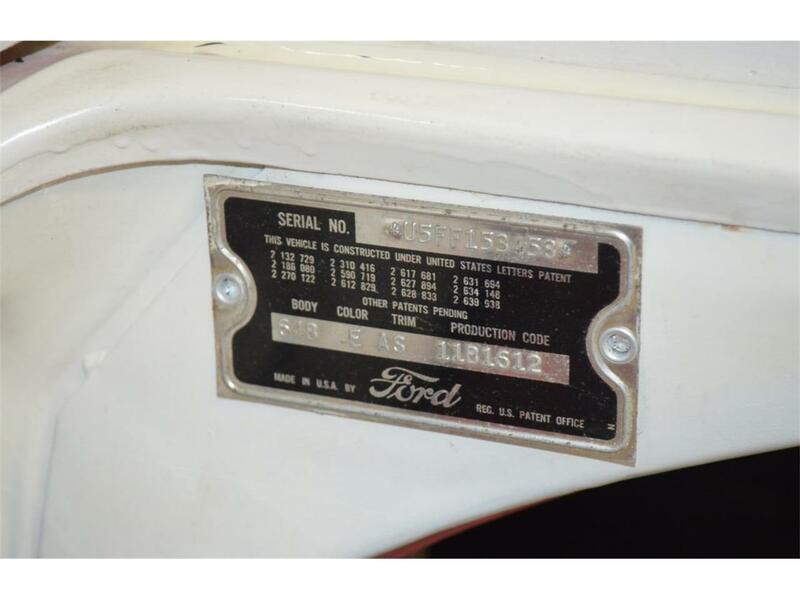 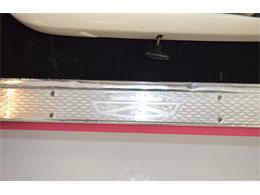 The Skyliner nameplate returned for the hardtop convertible in 1957. 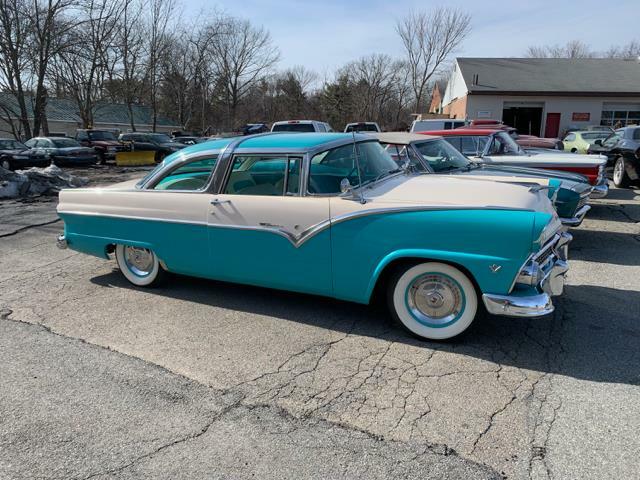 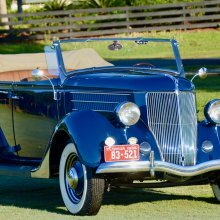 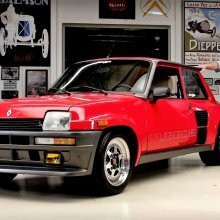 This beautiful car will bring you back to a simpler time where a gallon of gas cost 23 cents, and the beginnings of rock and roll could be enjoyed. 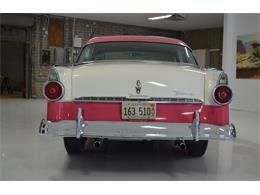 For more details call Harry Clark at +1.602.245.7200 or email us at harry@classicpromenade.com.